In the United States mobile phones may be unlocked but phone operators are not legally obliged to assist you. In France however, according to a by-law passed on the 17th of November 1998 (text, scan), phone operators are obliged to unlock your phone, for a cost during the first 6 months of a contract but for free after the initial 6 months. 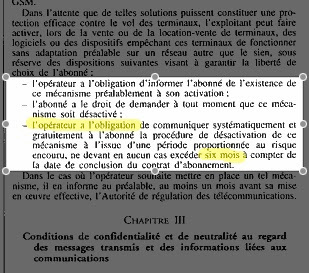 All three operators have lost civil lawsuits citing this by-law: Bouygues Telecom in April 2000, France Telecom Orange in January 2002 and SFR in October 2002. Vivre le iPhone! Vivre la France! ripp what do i do to get the iphone unlocked? Pouvez vous m'envoyer un @ d'instruction au sbasar@gmail.com pour la desactivation du systeme de blockage des sim-cards? En Belgique, c'est encore plus simple: La loi interdit la vente de téléphones mobiles verrouillés. It is even easier in Belgium, it is forbidden, by law, to sell locked phones (or to lock phones for that matter). Will Apple ever sell iPhone in Belgium? I wonder what is going to happen in Finland - the Nokialand. We do not have locked phones here at all, iPhone would be the very first one. just to let you know turbosim x sim 3 works perfectly unlocking 1.1.2 otb iphones us and european versions if you have a european version u need the sim that comes with the iphone. then u need to put the x sim 3 turbosim and the sim that came with iphone in to anothe iphone a new menu will come up called stk . select it then choose english then select other iphones then select copy sim card data. i bought an unlocked iphone and i plugged it into itunes and i accidentally clicked "restore and update" and it completely deleted everything and now the phone doesnt even have a menu....the only option i have is to make emergency phone calls....is there any way to unlock it? I have an iPhone 3G from Orange. I have just completed unlocking it. After 6 months (as noted) I called Orange and requested that they "debloquez mon SIM" or "deverrouillez mon iPhone". They do not make it easy. When I first called they said it would take 3 days. After 3 days, they said it would be a week. Finally received email after 8 days, 4 calls, and 2 emails to their support. To unlock, you just do a "Restore" in iTunes. At end of this process, iTunes indicates that there is an update from the service provider & asks if you want to apply it. This is the unlock. Tested it with my US T-Mobile SIM & it works great. Unlocked iPhone - harder than initially thought?